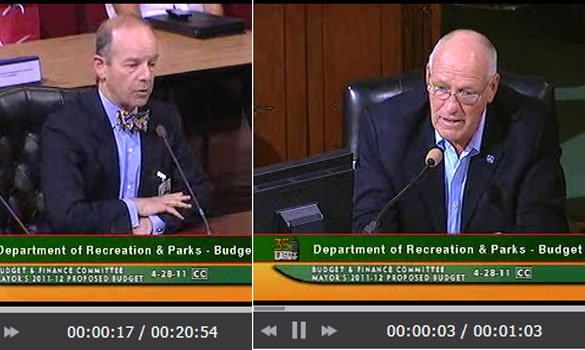 At yesterday’s meeting of the City Council’s Budget and Finance Committee, Councilman Bill Rosendahl, who represents the Venice area, endorsed the kind of plan put forward last year by the non-profit L.A. Parks Foundation to raise money for city parks maintenance and operations by selling space to what was termed “corporate sponsors.” The Venice Beach part of the plan called for 200 signs on an 8-block stretch of the Boardwalk, a total sign area of almost 10,000 square feet, or the equivalent of 15 full-size billboards. Among other heavily-used parks and recreation facilities slated for advertising were Griffith Park, Pan Pacific Park, and the Sepulveda Dam Recreation area. Signs were to be placed on playground fences, shelter roofs, the bottoms of swimming pools, along trails, and on walls of child care centers. The plans surfaced after the Recreation and Parks Commission voted last October to allow dozens of images from a Warner Bros. “Yogi Bear” movie to be placed in three city parks for a month in advance of the movie’s premier. That plan, which was to net the city just over $46,000, was abandoned after public outcry from communities in which the parks were located. After listening to commission president Barry Sanders complain that the City Attorney’s office was unfairly jeopardizing so-called “public/private partnerships” by insisting the park advertising scheme would violate the city’s sign ordinance, committee members Rosendahl, Bernard Parks, and Greig Smith expressed support for selling advertising in the parks as a way of raising badly-needed funds for operations. Parks questioned whether the City Attorney’s advice “is more of an opinion as opposed to a legal basis” and Sanders said the commission should develop and administer its own sign regulations, as opposed to being governed by the citywide sign code that prohibits any new off-site advertising. Sanders argued, as he has on several on several public occasions, that signage such as the Yogi Bear images that were to be hung from playground fences, attached to light standards, and wrapped over picnic tables, did not constitute advertising even though the images were identical to ones on billboards and other ads for the soon-to-open movie because they didn’t contain any information about movie times or locations. Committee member Paul Koretz strongly disputed this characterization, although he said he supported the concept of public/private partnerships to raise revenue. KCET’s SoCal Connected series has covered this issue in depth. You can watch their report here. Also, Ron Kaye has detailed commentary on the issue at RonKaye L.A.